Getting tired of waiting for the Round handguard. Re: Getting tired of waiting for the Round handguard. Even if you find one of these in Europe somewhere, it cannot be shipped to the US due to EU export restrictions on weapon parts. So how are Sig legacy parts being brought in for the 550 series by JDI or non US Austrian AUG parts? Aren't these restrictions on "critical" parts only? This isn’t a factual statement. I recently ordered a compensator for my Sig Tac 2 from Denmark with no issue. Most of the Euro stores that I looked at actually were using US EBay stores. You might want to take a look there if you haven’t already. Are you sure, as Corvus defensio ships gun parts to the US all the time. And besides, its not a critical part for a firearm. And if i really needed to..i know an importer. Only have to figure out how to keep it attached, the set screw is a rudimentary idea that may work at first, the only thing i have left to Do is to shrink down the length, as it is too long right now. Drill a small hole and then superglue a heli-coil in it. Then use a small set screw. Easy. 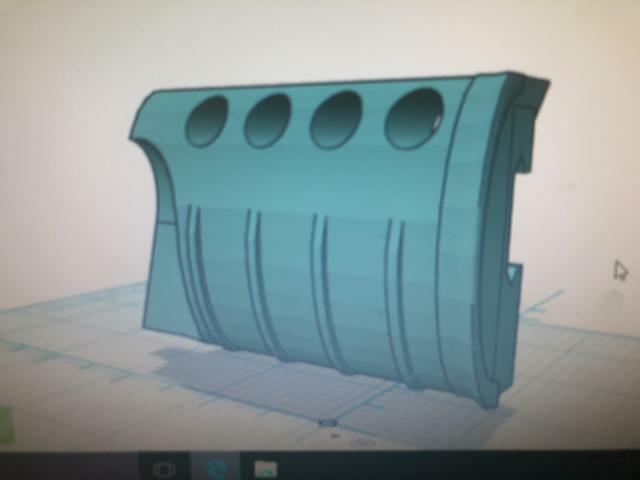 Guys, Update today, I believe it is ready to goto its final print, I have to send the file to the guy tonight to see if he can print it for me one more time. After I finally get this done, I have a plan for making another 3d printed piece for the X95 that most of you will find useful. Here it is for you guys to look at, sure you can have it printed through shapeways but its only one side the dimensions should be good, but i want to make the finger grooves more rounded instead of square sides. Would you be willing to send me the .STL file? I have a buddy with a 3D printer. Just for fun I'd like to give this a try. I also might be able to duplicate this in Solidworks. I don't think it would be that hard to make the inverse so you could have both sides. Sure you can download the STL from that link, if you are going to modify it in solid works i’d like you to message me and we can work together on it because theres a few things id like to improve that im having issues with in thr limitations of tinkercad. Guys i need some motivation to keep working on this project. I'll give you $1,000,000.00 if you finish it within 30 days, to my satisfaction!